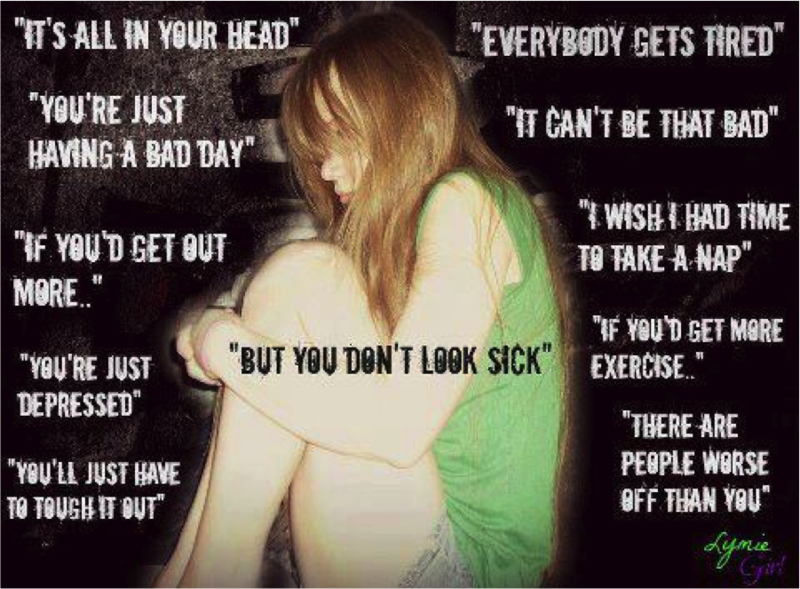 Find us on Google+ Gastroparesis: How to Deal with the Situation , "But You Don't Look Sick!" How to Deal with the Situation , "But You Don't Look Sick!" If you have a chronic illness, you've probably been told this lots of times. I know that I have. Sometimes, it's from people who are really trying to be encouraging and polite because they aren't sure what to say. With others, it can be malicious. So, I posed a question to EMILY'S STOMACH The question was, "How do you handle these situations when people say these things to you?" I received a variety of responses. People like Paige have heard things like, "You'd be healthier if you ate more veggies...maybe you should eat some salads..." to "maybe you need some fiber." Fiber is the WORST thing for someone with Gastroparesis to eat because we have so many issues with digestion. Veggies also stay in our stomach and are harder to digest. They can lead to BEZOARS. My response is to try and educate them about my illness. I try and make them understand what I'm going through. I've used THE SPOON THEORY quite a lot. However, if people aren't open to listening to you explain your illness, then they never will understand. You are better off ignoring them or avoiding them because with all of the stress your chronic illness brings, you don't need that extra worry. A chronic illness is a long-term health condition that does not have a cure. Some examples of chronic illnesses are epilepsy, heart disease, diabetes, asthma, COPD, cancer, HIV, Alzheimer's and dementia, multiple sclerosis, Parkinson's disease, cystic fibrosis, Crohn's disease, Gastroparesis, and arthritis. Living with chronic illness can make you feel very alone. Learn about staying connected with people to help cope with your illness. Know that you have so much to share and learn from other people. Learn that others may have the same feelings as you and that they know what you are going through. Find a support group in your area for people who have the same chronic illness as you. Many organizations and hospitals run support groups. Ask your doctor or nurse how to find one. For example, if you have heart disease, the American Heart Association may offer or know of a support group in your area. Know that they care about you and that their support will help you. Helpful. They know someone else with the same illness so they are familiar with what is going on for you. Know that you need everyone’s support. If you have epilepsy your co-workers should know what to do if you have a seizure. There may be people in your life who want to help you take care of yourself. Let your friends and loved ones know how they can help you. Sometimes you just might need someone to talk to. You may not always want people’s help. You might not want their advice. 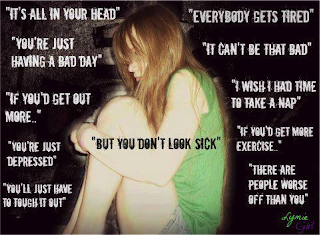 Tell them as much as you feel comfortable telling them about your illness and how you manage it. Ask them to respect your privacy if you don’t want to talk about it. If you attend a support group, you may want to take friends, family members, or others along. This can help them learn more about your illness and how to support you. Ask your doctor or nurse for ideas about where you can find support. If you do not know someone who can help you, ask your doctor, nurse, or social worker about different services that may be available in your area. You may be able to get meals delivered to your home, help from a home health aide, or other services. 1. Nola writes, "I had a discussion with my dad about this today. I told him it's easy for him to say that I need to get over it, because he hasn't been starving for six months and plagued by other health issues relentlessly for a year. He remarked that I still have a ways to go before I hit 100. I asked him how much he understands about my health, because I go into starvation mode and weight loss slows and sometimes reverses when it gets worse, and that if I was able to take my metabolic meds, I would weigh 20 pounds less. I told him I don't need him to commiserate with me, but he needs to acknowledge that I'm sick and doing all of this on my own, while he and my mother manage my brothers every medical appointment 2000 miles away (he's 32, I'm 35, so age isn't the issue)." I had people believe that it was all in my head for years. I was told that CONSTANTLY! Since my diagnosis in March of 2012, I've had friends who have read my blog, who have read what I'm going through, come and apologize to me. I was told by one of my friends that she knew I was sick but not that sick! My family doubted me for a while and I have to say the self doubt also started creeping into my thoughts. But, I can't make up vomiting. I think after my husband saw me projectile vomit off of the top porch a few times, he started to understand. 2. Heather writes, "I try to ignore them. It's hard but I do try! I also tell them why I can't do things like they do." I try to ignore the malicious people too. I have enough stress in my life without negative people. It does hurt, and sometimes it cuts me pretty deeply from people I thought I was friends with, but in the end, I don't need them in my life if that is how they are going to act. Constantly putting someone down is horrible, especially when you kick someone while they're already down. 3. Stephanie writes, "I refer them to The Spoon Theory... give them a chance to digest and then if they are close I'll initiate a follow up conversation, if they are not close I let sleeping dogs have their rest." 4. Nola writes again, "I had a friend who kept insisting she was going to 'get you back into he gym.' I asked her if I could get to eating more than a few ounces a day first. She then asked me to go kayaking. I told her I'm not consuming enough for a walk let alone an afternoon of kayaking. She hasn't asked about anything since. About two weeks and counting. I've started bluntly telling people, 'I have gastroparesis, it means my stomach is totally paralyzed.' Then I wait, wait, wait for it, the natural response, 'so how do you eat?' 'I don't.' Horror on their faces. At her sons birthday party two weeks ago, I said this to a woman I've known about 2.5 years. She said, 'I knew you'd been sick, but I thought like maybe a cold. You always seem like you are in such a good mood and have so much energy...how?' I smiled, 'I fake it.'" I have to admit that I fake being all right A LOT! I do so to avoid unnecessary questions and try to keep from drawing attention to myself. I don't want people to fuss over me or worse, say things like I hide behind my illness or I'm always sick. I just smile, put on makeup so I don't look like death warmed over, and go about my day. The people who know me well can tell when I'm having a bad GP day, but to the rest of the world, I'm just Emily. 5. Rose writes, "It all depends on how I'm feeling that day, but there are times I can't go anywhere or talk to anyone because im easily triggered and it's like I'm just ready for someone to say something to me so my defense is up. It gets to me when someone says I could never do that, like I have a choice, they are putting themselves down anyway because I have no choice but to do it, I'm glad I have strong faith." Stephanie writes, "I have actually said to people, you'd be very surprised what you can do when you aren't given the choice but to deal with it." We have no choice in the matter. Trust me, if we could turn Gastroparesis off, we would in a heartbeat. It's not a healthy way to lose weight because your body starves and becomes malnourished. Additionally, pain is NOT a choice. The gastric spasms we have are very real and it hurts. I cry because mine get so bad that I actually pull stomach muscles during spasms and vomiting. The spasms lead to vomiting and the vomiting leads to more spasms. It's a vicious circle that we don't choose to have. This does lead to a positive point though, you never know how strong you are until it's the only choice you have left. 6. Melissa says, "I am at the point where I don't even give them a chance to say anything back, because I stay away from those who don't have any clue of what I'm going through, just like they think I am OK! Because I 'fake it' to I make it. It's best to distance yourself from those that are only hindering your health by contaminating your mental well being. I explain to others how I'm feeling and what is going on with this & that (pain & illness) an all they can says is, 'Oh! I was sick like that TOO!' Completely clueless." I have lots of friends who don't understand what I'm going through. I don't think people can ever truly understand unless they've been there. I try to educate the best I can and for the constantly negative people, as I've mentioned before, I don't talk to them anymore. It's not something I can deal with right now because my patience isn't what it used to be because I'm too ill to deal with petty drama. But, I am determined to spread awareness about Gastroparesis to help educate those who don't know about it. I mean, I didn't know about it until I was diagnosed with it last year. But, I've never been negative to anyone I know with a chronic illness. There have been times when I didn't know what to say, and that's fine. But if you can't say something nice, don't say anything at all. 7. Julie writes, "I have been accused of just wanting attention." I've been accused that as well and I ignore it. Those people are delusional. Who wants to pretend they are that sick? Because we enjoy staying home and not having a social life? Because we don't suffer enough. This is one thing that really does bother me. I just want to tell all of you out there who deal with this on a regular basis - stay strong. You have a GP family who loves you and understands what you are going through. You have so much to live for, don't give up. I want to give a special shout out to Lyndsay, whom I am talking with tonight. She needs love and light, so please keep her in your thoughts. I want her to know that she is loved and there is hope.